Roll up roll up for a night of fun at The Taw Restaurant with all the family (in support of the North Devon Hospice!). 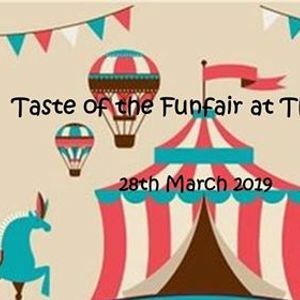 The Taste of the Funfair, run by FdA Business Events Management students, will featuring a 'stack your own burger' challenge, lots of games plus a mini workshop from Higher Beings! Victoria Waller, co-organiser, told us: "This event is fun for all the family with inspiration taken from our own children and experiences." Adult tickets cost £12.50 whilst children's are just £8.50. Call 01271 852483 or email dGhldGF3IHwgcGV0cm9jICEgYWMgISB1aw== for reservations.